B-18 Replaces The Martin B-10 As The Army Air Corps' Standard Bomber. 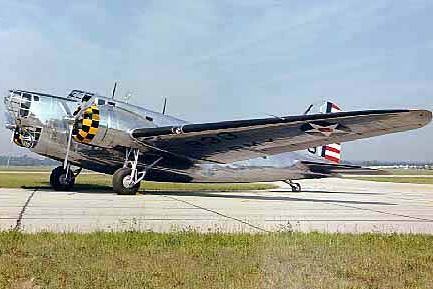 The Douglas Aircraft Co. developed the B-18 to replace the Martin B-10 as the Army Air Corps' standard bomber. The Bolo's design was based on the Douglas DC-2 commercial transport. During Air Corps bomber trials at Wright Field in 1935, the B-18 prototype competed with the Martin 146 (an improved B-10) and the four engine Boeing 299, forerunner of the B-17. Although many Air Corps officers believed the Boeing design was superior, only 13 YB-17s were initially ordered. Instead, the Army General Staff selected the less costly Bolo and, in January 1936, ordered 133 as B-18s. Later, 217 more were built as B-18As with a "shark" nose in which the bombardier's position was extended forward over the nose gunner's station. By 1939, underpowered and with inadequate defensive armament, the Bolo was the Air Corps' primary bomber. Some B-18s were destroyed by the Japanese on December 7, 1941.